Stephen’s successful outing on our 2015 'Melodies of the Danube' cruise, as well as his outgoing personality and depth of knowledge over a wide range of winemaking, cultural and musical topics makes him an excellent choice for AmaWaterways. Notaviva Vineyards has been selected once again by AmaWaterways to host its newest itinerary, the "Taste of Bordeaux" European river cruise upon the beautiful AmaDolce. The ship departs from Bordeaux, the capital of Aquitaine in Southwestern France and one of the world’s undisputed wine capitals. Guests will have the opportunity to discover stately chateaux, abundant vineyards and stunning scenery as they sail along the Garonne River and its surrounding estuaries, calling upon port cities like Cadillac, Bourg and Libourne. A key attraction of the cruise will be the onboard wine and music lectures, hosted by Notaviva’s co-founder and wine composer, Stephen Mackey. With a degree in music from the University of Miami, ten years on the road as an Internationally touring live audio engineer, and ten years at the helm of Notaviva, Stephen’s style, experiences and personality have made him an engaging presenter. His forthcoming memoir "Dream. Build. Believe." detailing the founding of Notaviva Vineyards will give guests unparalleled insight into the challenges of founding a Virginia farm winery. "Being invited back by AmaWaterways to host their newest cruise offering through the magnificent Bordeaux wine region is a wine composer's dream come true," said Mackey. 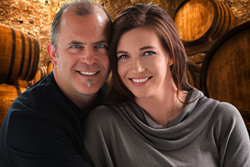 "With our unique brand identity of pairing wine and music coupled with our expertise in creating memorable customer experiences, Shannon and I are confident we will deliver informative, engaging presentations that not only educate our guests, but entertain them as well." Liz Barrett, Manager of Sales and Business Development for AmaWaterways adds, "Our wine cruises have been designed to deliver unforgettable experiences for our guests. Stephen’s successful outing on our 2015 'Melodies of the Danube' cruise, as well as his outgoing personality and depth of knowledge over a wide range of winemaking, cultural and musical topics makes him an excellent choice for AmaWaterways." Partnering with Notaviva is Loudoun-based travel agency, Expedia CruiseShipCenters of Leesburg. Co-founders Val Kittson and Jane Munzell were the visionaries who originally brought Notaviva Vineyards and AmaWaterways together. "After receiving such amazing feedback from our customers who sailed the Danube with Stephen and Shannon, we are thrilled to be offering this incredible new experience," said Munzell. AmaWaterways is currently offering a $750 per person discount through March 31. For booking information visit http://wineandwaterways.com/tasteofbordeaux.htm. Wine, food, travel, music, or book clubs may contact Notaviva Vineyards for information about scheduling a private wine tasting and cruise overview presentation customized for your group. Founded in 2002 by river cruise pioneers Rudi Schreiner, Kristin Karst and Jimmy Murphy, AmaWaterways is the premier river cruise line on Europe’s Danube, Douro, Main, Mosel, Seine, Rhine and Rhône rivers. Known for its custom-designed ships, extensive complimentary amenities and impeccable service, family-owned and -operated AmaWaterways consistently leads the way in river cruising. With itineraries in Europe, Russia, Africa, and S.E. Asia, AmaWaterways offers an enticing variety of authentic, in-depth experiences for the most discriminating travelers. For more information, visit their website at http://www.AmaWaterways.com. Founded in 2003 by husband and wife team Stephen and Shannon Mackey, Notaviva Vineyards is the world’s only winery that pairs wine with music. Located in scenic western Loudoun County one hour west of Washington, D.C. Notaviva’s authentic winemaking style reflects their unique terroir. Their commitment to engaging customer experiences is reflected in their wine, their team, and their event designs. Featured in the 2008 HGTV television series “Dream House” the Mackey’s story of founding their vineyard while raising a family has inspired people across the country. More information on the cruise and their vision can be found on their website at http://www.NotavivaVineyards.com.